There are so many books in the world. They come in all shapes and sizes. Some people like bright, new books. Others like old, worn books. As much as I would like to say that I love all books I have to confess that books with a little experience draw me in more. They feel tried and tested to me. The best books in my book are those with at least a couple of centuries behind them. With that in mind you will understand the enchantment I have found myself under recently with a most wonderfully old book. It is a marvelous specimen from the early 17th century. 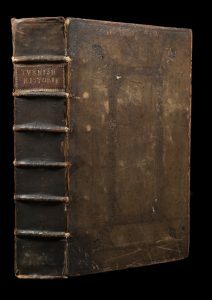 Printed in London by Adam Islip (d. 1639), this book was bound in brown calf leather, which must have been rich and sensual to the touch earlier in its life. The book now wears this leather like armor that has seen some tough days on the battlefield. Somehow, despite the cracks where the boards meet the spine, it is still elegant. Although the slightly decaying leather may leave a minor brown smudge on an unsuspecting viewer’s shirt, the outer accoutrements remain steadfast in their dual missions of beauty and protection. The front and rear covers offer to the viewer a framed pattern blind-stamped into the leather. Along the spine large raised bands fit perfectly in the hand, but more importantly, these bands are the anchors for a hand-sewn binding that has lasted for centuries. Lifting the front cover, the board is heavy; not just a little heavy, but seriously heavy. Lifting the front board is like lifting a draw bridge. It is a reminder that this cover protects something worth protecting and warns the reader not to pass lightly. The book itself is also heavy. Consisting of 1,152 pages, this book was not meant for fanciful entertainment while traveling. At approximately twenty-three centimeters wide, thirty-two tall, and eight deep, its size confirms that this book is profound and consequential. 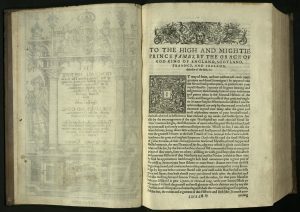 The reader opens to the title page and finds there an elaborate copper-plate engraving, drawing him in. We have Laurence Johnson (“Sculpsit,” Latin for “he engraved, carved, or sculpted it”) to thank for this image, wherein we see noblemen, one on each side of the page. On the left stands a European and on the right an Ottoman Turk. The beauty of this page makes the reader want to linger, but it is quickly observed that the font on the subsequent pages is delightful and there are many more engravings to examine throughout the book. As the reader opens this book the smell of it cascades gently over him or her. It is not an unpleasant smell, despite the book’s age. Rather, it is a wonderful smell. It is the smell of leather and paper that have soaked in their surroundings for four hundred years. This book has a clean mustiness that tells the story of owners who have lovingly cared for it through the long years since its printing. 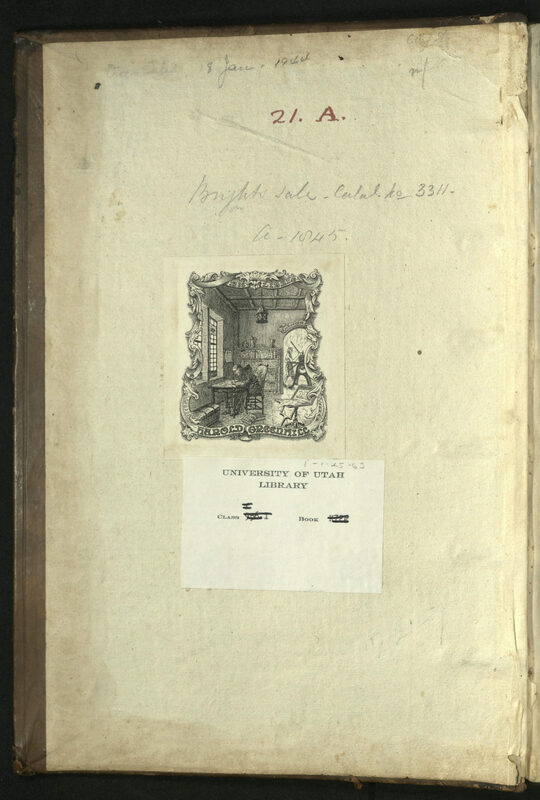 The University of Utah’s copy was part of the Benjamin Heywood Bright library, which was auctioned by Sotheby’s in 1845. Bright, who became a well-known antiquarian and authority on Shakespeare, began collecting around 1809. 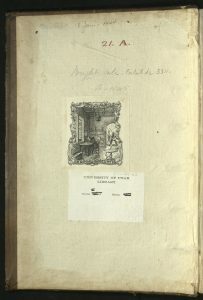 Sometime in the 19th century, the copy became the property of Harold Greenhill, as evidenced by his bookplate. Just as the physical features of this book indicate, the subject matter is a weighty one. 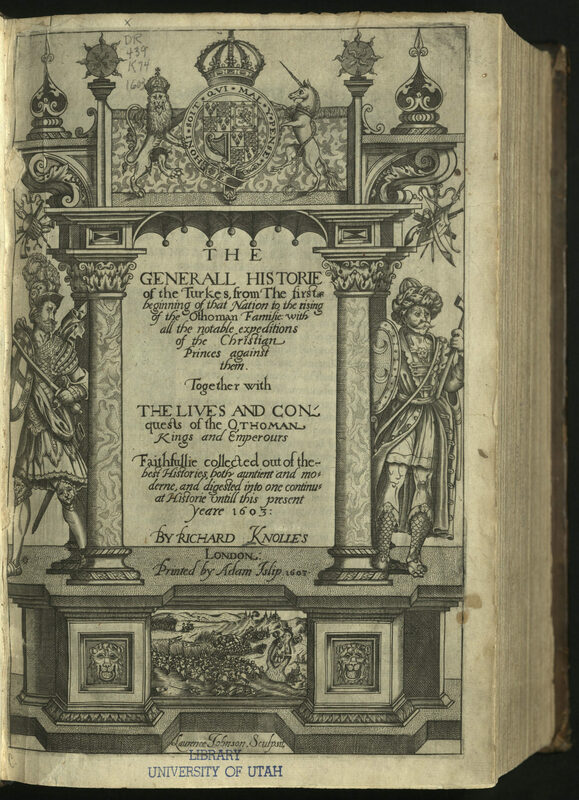 Written by Richard Knolles in the last decade of the 16th century, The Generall Historie of the Turkes is recognized as a major historical treatise. 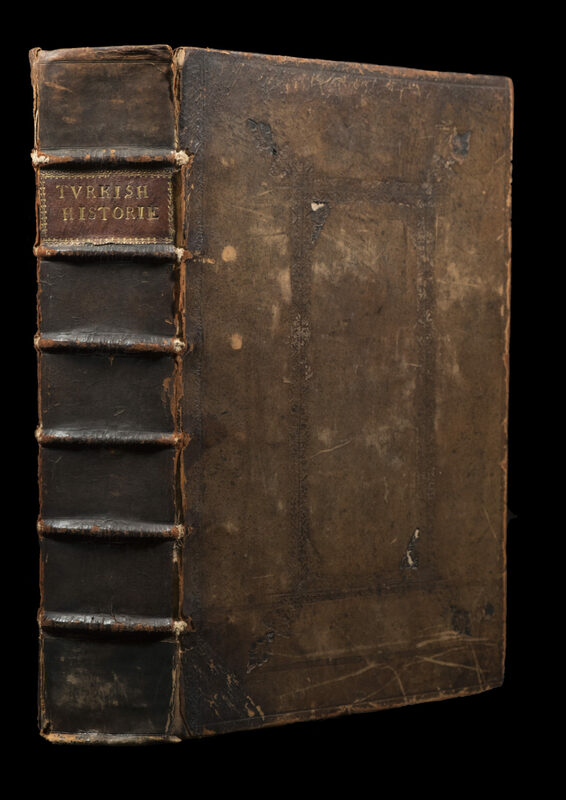 Written in English rather than the more scholarly and academically accepted Latin, the treatise consists of a compendium of accounts by historians in the 14th through 16th centuries. Like most European historians of the day, Knolles relied on earlier European works for his information and much of his viewpoint. 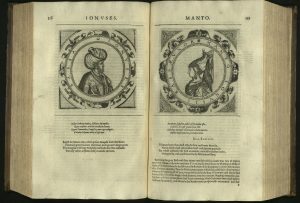 He relied most heavily on Jean Jacques Boissard’s Vitae et icons sultanorum (1596), from which were copied twenty-eight engraved portraits of Turkish sultans, their wives, and European kings. Knolles strongly edited the accounts, however, which resulted in the reader fully experiencing a propagandist diatribe throughout. 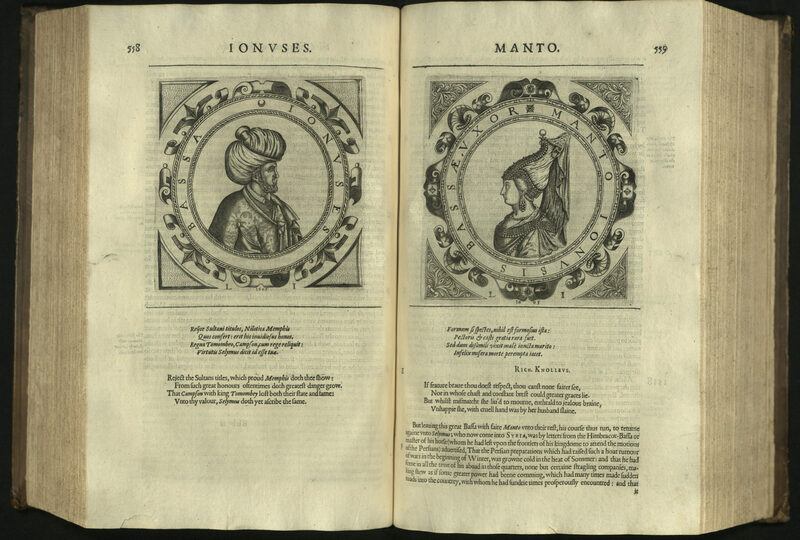 The fact that Knolles chose to publish the work in English rather than Latin is noteworthy. It suggests the intent to reach a large audience and to sway public opinion. Due to the work’s role as a propaganda device it was important for common people to be able to understand it. The treatise was indeed influential. Later writers, such as Samuel Johnson and Lord Byron, read and commented on Knolles’ work. 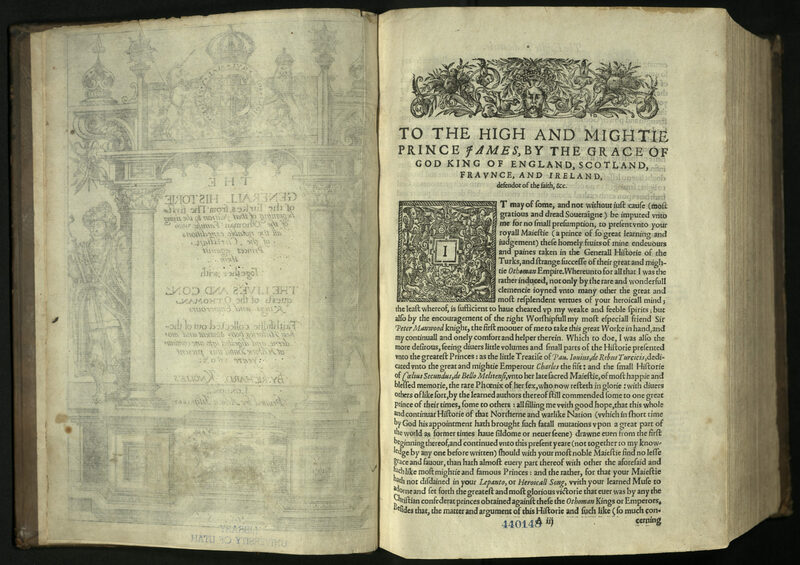 It is also widely accepted that The Generall Historie of the Turkes influenced Shakespeare’s writing. 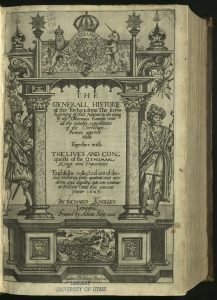 Knolles’ Generall Historie was certainly a success, running through new editions seven times between 1603 and 1701, most with varying additions and abridgements. 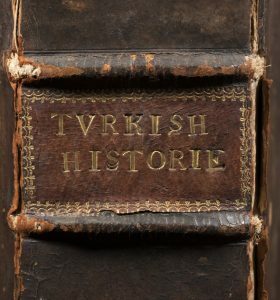 The first edition probably consisted of between 1250 and 1500 copies, the maximum number of copies allowed by a 1587 regulation. History repeats itself. However, each generation, I would hazard to generalize, feels as if it is forging ahead into uncharted territory. If a person (a pesky historian or even a curator of rare books) were to point out a historical example which perhaps might support an argument regarding the nature of history and its cycles, others may be quick to point to all the ways in which current events differ from those contained in the historical example. 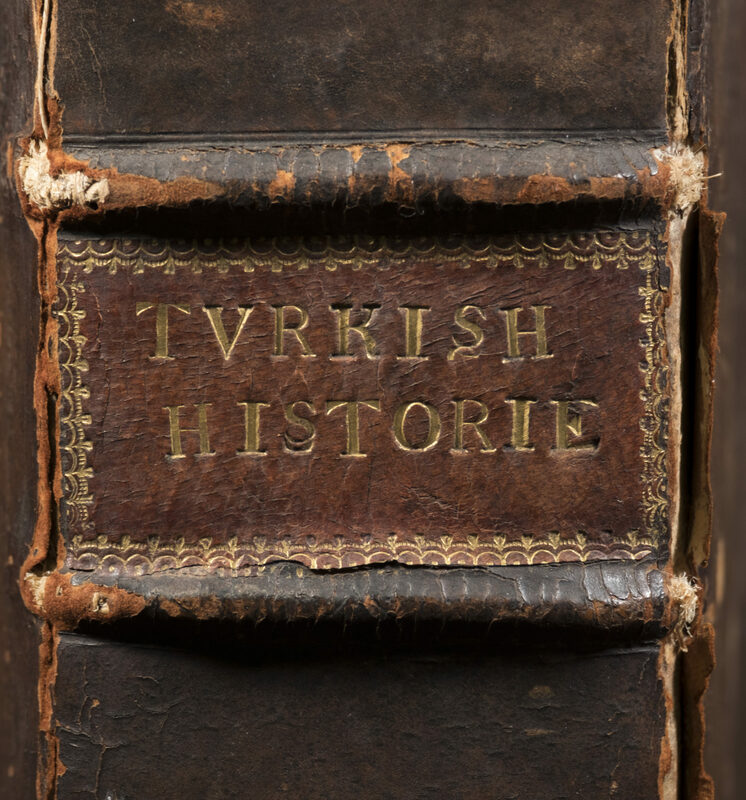 The Generall Historie of the Turkes is a marvelous portal which allows us to view how many of the modern western world’s most difficult issues were being treated at the turn of the 17th century. In 1453 Constantinople, the capital city and last hold-out of the Eastern Roman Empire, fell to the Ottoman Empire. To put it mildly, this did not please the western Europeans. To turn this into an almost unforgivably simple tale, the Westerners (predominantly Christian) traveled to the Near East (what we now often refer to as the Middle East) and began to carve out little kingdoms for themselves. Religion played an important role in the impetus for these actions. Some may claim that today the impetus is oil, but religion or oil makes not a lot of difference in the grand scheme of things. The bottom line is, westerners (Europeans) showed up in the Near East and started telling the local people how things would run. Naturally, this (then as it is now) was hard for the local people to accept, so they pushed back. In the 15th century they pushed back right into Europe. In the 21st century it is no different. These two cultures have clashed repeatedly over centuries, and so it is that a four hundred year old book acts as a portal that looks suspiciously like a mirror. I love that the physical attributes and the subject matter of this book are so at odds. This finely crafted, beautiful book is the physical medium of an aggressive topic. History is anything but pretty, yet the books (at least in this case) containing it can be. Perhaps that is not without intention. It just goes to show, you can’t judge a book by its cover.